Brand refreshment means modifying the existing advertisement with slight corrections. An advertisement sounds haggard and old. When it is trying to influence a new buyer segment such as youth, women or children, etc. When it becomes difficult to survive in the market place with the existing advertisement! Yes, we mean. Make your campaign sound like human by adding slogans and taglines that exude confidence. Perhaps you might have heard the famous byline – “An impressive picture is worth 1000 words.” You can make your advertisement stand out by adding impressive visual elements. Also, you needn’t worry about escalating costs of color selection because many online eCommerce stores selling personalized oval magnets offer free full color printing. No one can predict what went wrong with your earlier campaign and perhaps you are the best judge and critic of the campaign that you started and ended. You can introduce certain engaging branding elements, which did not exist before. Customers understand, clear messages. You can offer them clear messages by telling what they can expect on buying from you. How your products will work for them? Why they should rush to buy it from you before the sale ends? Avoid fluff and sent clear messages that cuts across barriers. It may take time to regain your lost positioning over search engines, but you can attract customers to visit your website by sending customized full color magnets to their homes. This term is gaining popularity in the internet market space and you can see online forums buzzing news of businesses attempting Google re-targeting or Facebook re-marketing using various digital tools. You can combine the intelligence of cookies and other digital tools for persuading customers who deflected from your website due to some reasons. You can individually mail full color printed magnets proclaiming several benefits to customers, who have registered with you and failed to complete the purchase due to some reasons. 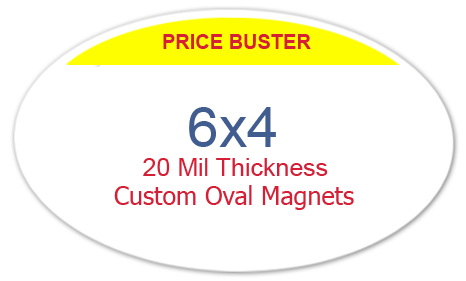 By sourcing customized oval magnets 4×6 from any reputed eCommerce magnet store stocking made in USA magnets, you can save on online design proof, shipping, art setup, and many other areas. Apart from savings, you are attempting a quality magnet, which respects American work and labor traditions with ease.